The Zeonic Geofront: K-On! FIGMA GET! I sometimes wonder if Max Factory has a bug secretly planted in my house and hears my plea that certain figma's MUST be made. So on their blog today they announced Yui Hirasawa from K-On! and her sister. And they look fabulous. 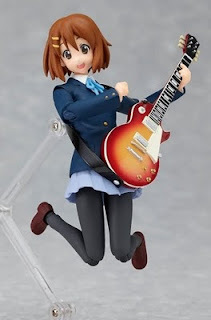 The company Mobip made poseable K-On! figures last year, with each girl coming with a piece of Ritsu's drum kit. When they first showed the figures they didn't seem very impressive. However, after getting to see them in person from a friend of mine, I can say they are actually really good figures. They are notably larger then the Figma's which is nice. The other good thing about the Mobip over Figma is that at least you can get the entire band. With the way Max Factory releases Figma's we will get Yui and Ui now and probably Sawako Yamanaka (the teacher) then we will have to buy some limited edition video game for 10,000 YEN, that comes with the "Don't Say Lazy" Mio. Then five years later they will release the other girls. Do I sound bitter? Once burned twice shy I say. Regardless I hate to look a gift horse in the mouth and will eagerly preorder the Hirasawa sisters. UPDATE: Also these girls are out in just two weeks! That's a fast turn around. Makes me wonder why we have to wait until May for that Rider Figma.